ROME, Dec 18 (KUNA) -- Italian President Sergio Mattrella has lauded the significant growth of the distinctive ties between his country and Kuwait and voiced satisfaction at the mutual cooperation for boosting dialogue and stability and peace worldwide. The president made the remarks during a meeting with the State of Kuwait Ambassador to Italy, Sheikh Ali Al-Khaled Al-Sabah, late on Monday. 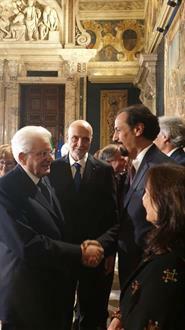 The envoy gathered with the president, along with heads of diplomatic missions in Italy, at the presidential palace, to express felicitations on Christmas and new year. The Kuwaiti embassy said in a statement that Sheikh Ali Al-Khaled conveyed greetings from His Highness the Amir and congratulations on the eids. For his part, the president asked the envoy to relay his salutes to His Highness the Amir, affirming depth of the bilateral relations and expressing desire to visit Kuwait as soon as possible.